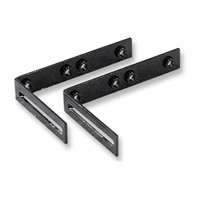 The EZ Mount Extension Brackets, were created to allow for two (2) RMS under the shelf whenever there is a requirement to add a lightweight device that doesn't require rotation. A surge protection power strip is an example of the use of this part. Note: The EZMBS is used to allow for the swivel capability of the additional two (2) RMS, or when a heavier rack mount device is placed under the shelf. This part can also be used to mount a rack mount (2 RMS) device vertically against a wall, or on a relay rack, where depth is limited or unavailable! - Dimensions: Each angle bracket is 5/8" wide x 2-5/8" long (with slot) by 3-3/4" long with one (1) or two (2) RMS mounting holes with 10-32 threads. - Mounting Holes: EIA/TIA spacing. - (4) zinc/stainless 10-32 screws. 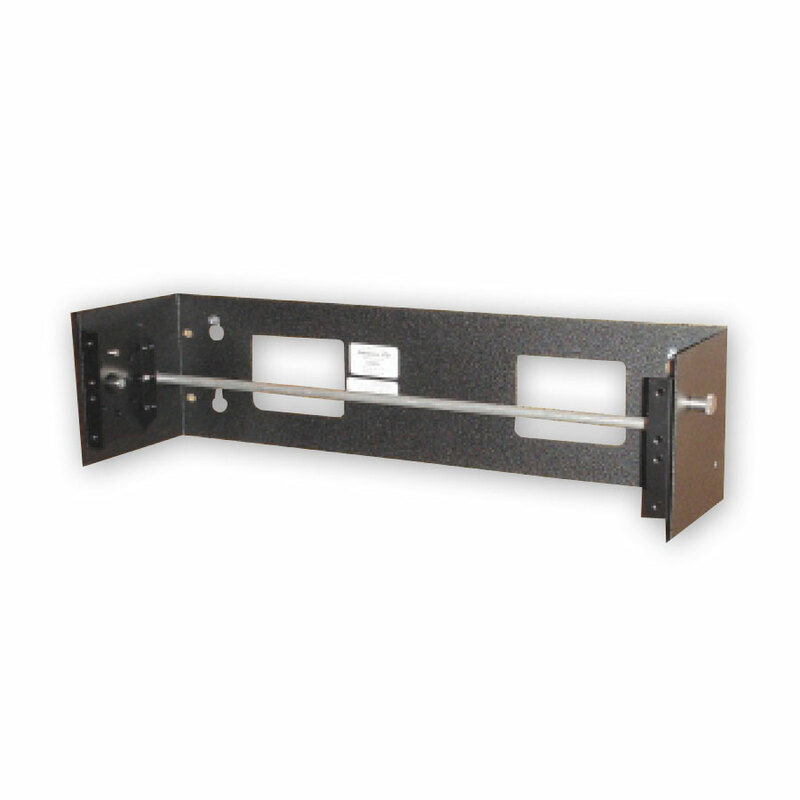 The addition of the matching EZ Mount Wall Swivel Bracket Shelf (only 8 inches deep), allows for completion of a small network including patch panel and hub or switch in the smallest footprint allowed: a mere 5 inches high by 19-1/2 inches wide! The design allows the project to be completed in a very tight area, without requirement for excess space to the left, right, above or below. It is truly the perfect solution when real estate space is very limited, and the requirements are "too small" for the original EZ Mount Network Shelf. Equipment tie down slots are provided when, and if, required. - Dimensions: 19-1/2" wide x 8" deep, with one 2" wide x 1-1/2" deep cut-out (rear center) for wire/cable entry. Two slots, 1/4" x 1-3/4" wide, for Velcro® tie-down (if necessary). - Mounting Holes: Vertical slots on 16" and 18-1/4" centers. - Mounting Options: Mounts on EZ Mount® Swivel Wall Bracket (EZMBL). The EZ Mount Swivel Bracket was introduced as a separate product, in response to the numerous requests during the introductory demonstrations of the EZ Mount Network Shelf. The bracket also allows for the expansion capability of the EZ Mount Network Shelf from 48 ports to 96 ports by mounting the bracket under the shelf in the holes provided. It is also a very important accessory for the EZ Mount Network Shelf, because it expands the shelf two (2) additional RMS that can be used for another patch panel (up to 48 ports) with swivel capability, OR it can be used to mount additional products. - Locking Positions: There are eight (8) locking positions to allow easy access to patch panel(s) regardless of mounting height. The EZ Mount Wall Swivel Bracket was finally created after many suggestions from contractors and end users alike. It is the best solution for mounting up to a 48 port patch panel on a wall. It swivels within its own space, and, provides a solid punchdown surface, without the technician having to support the punchdown process with the other hand! EZMBL can also be mounted on a relay rack and/or under a table/desk. The EZMBL is the premier solution when space is at an absolute premium! - Dimensions: 5" high x 5" deep x 19-3/8" wide (not including plunger assembly). 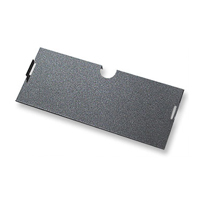 - Mounting Holes: Key holes on 16" centers / Slots on 18-1/4" centers. NOTE: The entire footprint of wall space needed to complete this installation is only 9 inches high by 19-1/2 inches wide. It installs directly on wall with 16 inch center spacing. 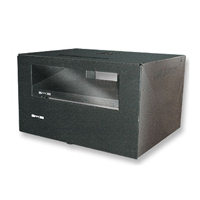 - Dimensions: 19-3/16" wide x 16" deep x 9" high (Shelf is 14-1/2" deep). - Compatible With (not included) One or two 12 or 24 port patch panels or one 48 port patch panel. (To expand to two (2) RMS, see "OPTION" below). - Weight Spec: When properly mounted, will support up to 100 lb. - Power Strip (not included) Mounting holes provided for one (1) rack mount power strip. - Mounting Holes: 4 key-hole mounting holes for 16" on center mounting. - Slots provided on shelf deck for equipment tie-down with Velcro® straps (not included). 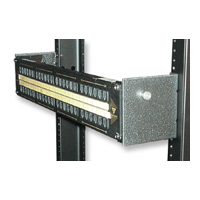 - Option: EZ Mount® Swivel Bracket to expand two (2) rack spaces (P/N: EZMBS). The EZ Mount Secur-A-Shelf is yet another truly unique product from iNNOdata, LTD. It was designed to provide not only security for the EZ Mount Network Shelf, which had been requested for over two years, and it can be added "after the fact" without disturbing station cables already installed, THUS ELIMINATING the NEED TO RE-CERTIFY THE NETWORK! NOTE: Adequate venting slots are provided in walls, bottom and top panels. There is also a provision for mounting a "muffin type" fan in the top if necessary! 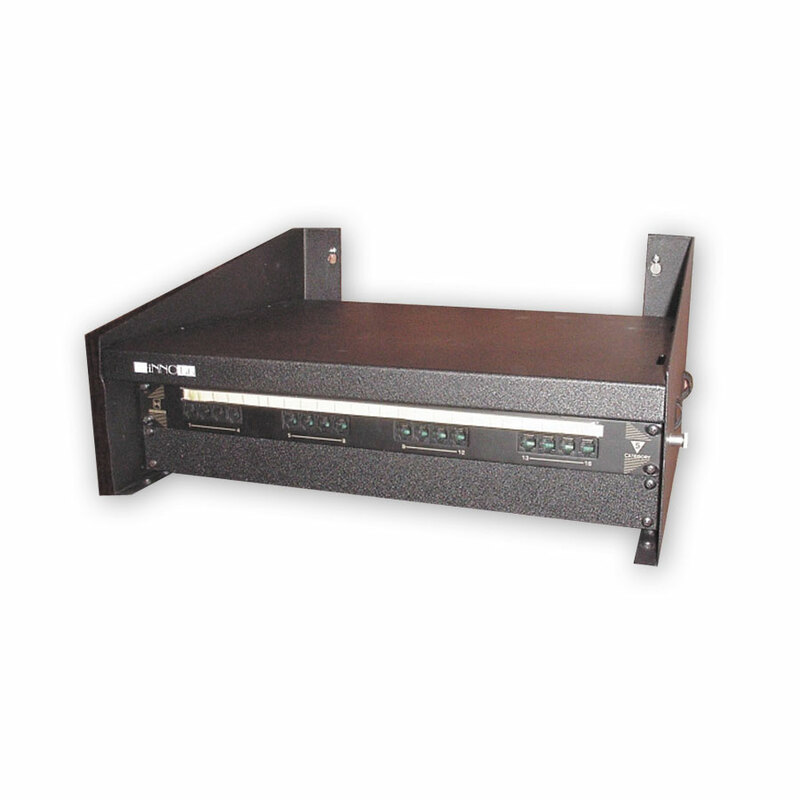 The Secur-A-Shelf will provide security for a complete network, including electronics (hub(s), switch, modem etc. ), power strip and up to a 48 port patch panel. It allows access to station cables from the front of the enclosure by virtue of the swivel bracket on the shelf installed inside. - Four (4) each, side slotted key hole type mounting holes to allow for 16" on center mounting. - (4) 10-32 black screws for use in bottom plate through side wall flanges. Support Rod, to hold cover open. - (4) separate pieces to include: Left and Right Hand Side Walls (2), Bottom Plate (1) and Top/ Front Panel (Hinged). - A plexi window is included in the front panel.